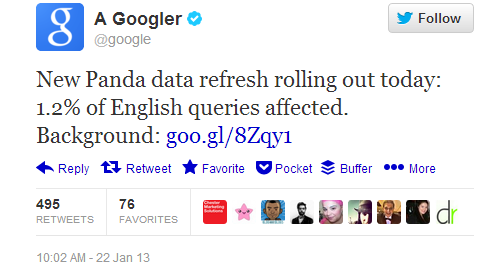 Google has updated its human quality rater backed algorithm- Panda affecting 1.2 % of English queries. This update is referred as Panda update number 24 and has started to refresh on Jan 22, 2013. Many sites have experienced fluctuations in rankings as a result of this update that is aimed at providing more quality search results to the user.